Last seen on the screen in The Sum of All Fears (2002), it is perhaps surprising that the film revival of CIA action hero Jack Ryan has taken so long. With his popularity amongst US Republican politicians, it is easy to imagine that the central protagonist of Tom Clancy’s successful series of spy novels could have made a model hero during the previous decade, at the rhetorical height of the ‘war on terror’. However, the Ryan reboot has only appeared following the substantial decline of both the war’s credibility and the moral certainties it once appeared to offer the espionage-themed action thriller. Indeed a shift away from such preoccupations is played out in the opening act of Shadow Recruit. Here we are provided with a new origin story for Ryan (Chris Pine), who is shown to witness 9/11 on television whilst studying at the London School of Economics, subsequently heading to war in Afghanistan as US Marine. Later, whilst recovering from critical injuries sustained in a helicopter accident, he attracts the attention of CIA officer Thomas Harper (Kevin Costner) and is enlisted so that he can continue to play his part in this secret world. However, the film’s central narrative quickly veers away from the ‘war on terror’ and into a story of economic skulduggery emanating from the newly-emergent Russia, the main location for the bulk of the film. This has the effect of partially reconnecting Ryan to his Cold War roots (for example, his screen debut in The Hunt for Red October ) but this time the anxieties on display are not provoked by Soviet communism but instead by the very topical and somewhat closer threat of unethical and unfettered capitalism. Yet the film struggles against the common problem of dramatising economic issues in a thriller narrative in a suitably compelling way, with too much of the film involving people urgently reading semi-comprehensible numbers from screens. In addition to an enjoyably Hans Gruber-esque performance as the film’s stony-faced Russian villain, Kenneth Branagh directs, continuing his late career shift into directing Hollywood blockbusters after from Thor (2011). The result is a reasonably compelling and pacy thriller, but there is little to elevate it in terms of either substance or spectacle from other similar material. Shadow Recruit also presents us with the first encounter between Ryan and his future wife from the novels, Cathy Muller (Kiera Knightly), though this is a rather thankless love interest part with the film doing little to sell the romance to us (and Knightley’s performance is somewhat hampered by a very strange accent). Pine gives the most interesting performance here, investing this film with a sense of thoughtfulness that it might otherwise lack, the highlights of which are in the early part of the film as Ryan gradually adapts to being unexpectedly plunged into a world of arbitrary violence. But ultimately, it is the very backward glance that comes with reviving Russia as the main geopolitical threat that prevents the film from ever quite developing a distinctive identity. To take an obvious point of comparison, the earlier reimagining of James Bond with Casino Royale (2006) took great relish in utilising the sense of a more complex and uncertain world to provide a clever deconstruction of the series’ conventions. 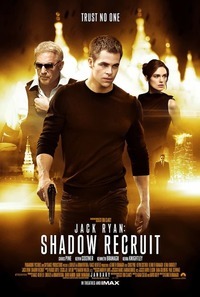 Shadow Recruit, however, is mostly rooted in fairly standard conventions from both Cold War and ‘war on terror’ era thrillers, blended together in a way that rarely feels like anything terribly new and exciting despite the ostensibly topical edge. This review was published on February 10, 2014.